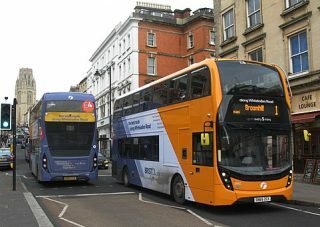 Bristol City Council has published a far-reaching transport strategy for the city, to be implemented over the next twenty years. The strategy offers a new vision as to how people will move around the city and aims to tackle the problems caused by traffic congestion, such as air pollution, health problems and difficult journeys between home and workplace. The consultation is now open, and to help the public see how the various options might work, there’s a simulator tool – an innovative approach which will help people visualise the future transport network in the city. So far, different elements of transport policy in the city, have been covered by regional or local plans. But there hasn’t been a strategy that sets out the detailed options for the city and also integrates them with the West of England plan. The council recommends reading the document in full – for anyone without the time to do this, here’s a summary of what it contains. Housing and population growth are two of the main factors that are going to impact transport in the city. 100,000 new houses are planned for the next twenty years and those people will all need to travel around the city, for work and leisure. Another factor is the drive to make equal transport provision for everyone. At the moment, some people find jobs and training hard to access because they have poor transport services. Health is also a concern, with air pollution from motor vehicles a major issue. City dwellers’ health is also being affected by lack of activity, so the council wants to encourage walking and cycling as ways of getting around. This means making some of the public places more inviting than they are currently. The council clearly understands that when you don’t know how long a journey is going to take, because of traffic, it’s stressful and can cause problems at work. They are looking at phone apps and other technology to help inform travellers. There are various themes in the strategy. “Citywide” is the whole transport piece – all the movements across the city every day. “City Centre” is going to look at improving congestion by getting people to walk, cycle and use public transport to get in and out of the centre. “Corridors” are the connecting roads that link neighbourhood districts to the centre of the city. Within those neighbourhoods, the “Local Centre” theme will work on how to make the local shopping areas easier to get to, and on ensuring that they are pleasant places to meet and shop (so reducing traffic into the centre). Most Bristolians live in “Neighbourhoods and residential streets”. The aim is to make these streets safer for people, and importantly, children, to walk and cycle in. Why not just Build more Roads? The council points out that building more roads increases traffic and that there isn’t room in the city to build the number of roads that would be required. In addition, the increase in vehicles would greatly exacerbate the air pollution problem. While approving of the Bristol strategy, Sustrans is one among many commentators to point out that cities will have to tackle on-street parking if they want to make the city a more attractive place to walk and cycle around. The council’s strategy involves working with industry to ensure that deliveries are made as efficiently as possible. Anyone reading the strategy, however, will immediately be struck by the fact that it doesn’t really take on board the changes to our shopping and transport habits, brought about by the internet. Having goods bought online delivered to our houses is going to increase traffic hugely and the policy doesn’t seem to have a lot to say about it. Similarly, cheap taxi services such as Uber, tempt more people to move from public transport to car journeys. The council is prepared to bring in various kinds of charges to penalise behaviour it wants to discourage. The strategy outlines some of the ways that money could be raised to pay for the transport improvements. These include workplace parking levies, congestion charging, imposing clean air zones and so on. Although as they admit, if everyone started cycling, the congestion charge would raise less money. Hikes in council tax or business rates have been ruled out as the amount to be raised is too high. If the answer really is a mass transit system – that’s an underground or tram service – the cost will be very high and the transport disruption will be a lot worse while the system is being put in place. However, this may be the only sustainable, long-term solution to Bristol’s congestion problems. The public response to the consultation will make interesting reading.